I am amused as I drive around nowadays and see "Airport" icons on blue informational signs and I have cause to think: "Well, no WiFi or Bluetooth there!" That is probably what children are thinking. They probably wonder why an airport cannot afford WiFi. Is this good UX, to re-use an already well-established informational sign icon for something with an entirely different meaning? Update: It was pointed out that there are many radio-emitting aspects of a phone beyond Wifi and Bluetooth and so I suggest that there be a single icon that covers all of the radio emitting aspects, like a little antenna with lightning bolts coming out of it. (I think this already exists...) Could they simply draw the red-circle-with-slash icon over such a Radio Emissions icon? Would that be obvious to everyone? 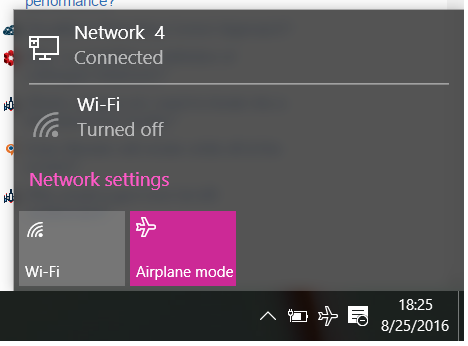 Further update: Apparently WiFi is allowed on some flights now, so that raises the question of why I see an airplane when I turn off WiFi on my laptop. But... the original question - why was the existing sign icon commandeered for something unrelated (airport nearby vs don't interfere with the plane) - is still very much on the table. I wish people would actually address that question, not the history of "why / how it came to be thus, mumble mumble." Please. "Your part will be to remain calm." Yes, you are right in questioning that some people might be confused by this. However, the usages of this icon each show in dramatically different contexts. The icon is used as "this is an airport" where it involves a location or direction: a map, a road sign, a list of locations in an app... On the other hand, the icon is used as "disable radio emissions" in a system settings or quick access menu on a device with radio emissions. I have yet to see a map, road sign or locations list that uses an airplane to indicate "disable radio emissions", and I've yet to see a settings app that uses an airplane icon to indicate "this is an airport". You're not just disabling wifi and bluetooth. You're also disabling other signals, like GPS tracking, your cellphone radio transmitter, location tracking, NFC,... Using an icon that only shows wifi and bluetooth would be confusing for some people. An icon that indicates DISABLING something (as indicated by a stop sign) is also confusing compared to an icon indicating a MODE or state toggle. If you have a button that serves to disable something, it's counterintuitive to press that button a second time if you wish to enable something again. It's also less obvious whether it's on or off. If I ask you to "turn disabled radio emissions on", you may go "what?" and do the wrong thing, like only disable wifi or bluetooth. On the other hand, a button that toggles a state is clear: when it's in the "on" state, the state is on. If you press it again, it goes into the off state and it's off again. If I ask you to "turn airplane mode on", you can see "oh, that's the button with the airplane icon". Cell phone manufacturers recognized that there needed to be a way to put it in a mode that was safe to use on an airplane. But what would they call such a mode? Airplane mode. Speculation: Perhaps when the feature was first released, the airplane icon was chosen so that it was a very obvious solution to the problem of flying but wanting to use your cell phone's other features--it screams, "are you on an airplane? USE THIS MODE!" ***As several users have stated, this is a popular misconception, however, the reason why passengers are asked to disable network capabilities of their phone is both irrelevant and out of scope of both this question and UX.SE. Airplane mode is much more nuanced than just "shut off the transmitter". The latest guidelines about that mode allow Wi-Fi to stay enabled even if all telephone functions are supposed to remain off. Further, bluetooth has always been able to remain on. So it's not just a Shut off All Emissions mode. It truly is a configuration solely for communication devices on airplanes. Given that it has no other use and that an antennae with a line through it doesn't convey the same function - ie: it doesn't shut off all transmitters in the device - then an airplane icon is the obvious choice. That said, there are quite a few cases in which words have radically different meanings depending on context. A simple word one is Content. One meaning boils down to being happy, the other has to do with what may be inside of something, a third more recent definition has to do with something that may be consumed. A simple phrase such as "We're not content until your content" can have a very different meaning based on that context. The way we know the difference is through context. Icons, as a way to present ideas in pictographic form, are no different. It's Ok to use the airplane icon for purposes other than "airplane mode" on mobile devices. However, in your context of use the airplane icon should make sense to the users. You should definitely test and verify that. If it's intuitive and users are not confused by it, you can use it. Just to note, it is not good to change the "airplane mode" icon with other one because this violates the usability heuristic of consistency. Definitely don't do this. It wasn't. The airplane icon was chosen to mean "airplane mode". As most of the answers point out, it's all about context. In the context of an airport, and one needing to use airplane mode, the airplane makes perfect sense. One does not typically (ever?) need to go into airplane mode outside of an airport. If you are upset that your laptop uses that icon to indicate wi-fi is turned off, then I'd say that's a failing of that UI design to understand context. UPDATE: Revisiting this answer, I see I maybe didn't answer the specific question about Windows 10. This may be a compromise by the competing interests at MS. The issue is that Windows 10 is device agnostic. It was designed to be run on entirely portable hardware as well as good 'ol desktop hardware. Maybe the argument was that if you are on a desktop, you won't ever need this feature, so the icon confusion wouldn't be there for most folks. This is not an "airport icon"; it is a pictogram clearly depicting an airplane and not an airport. The connection between that and airports is contextual. 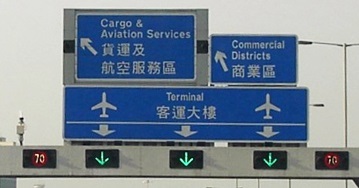 If you see it on a highway sign, then it denotes that "this is the path to the place with airplanes, i.e. airport". Why the airplane icon is used to denote the radio silent mode is that this mode is called "airplane mode". Airplane mode, thus airplane icon. "Airplane mode" in turn, derives its name from one the most common situations in which a personal device is obliged to enter into complete radio silence. For instance, large numbers of people rarely have the opportunity to go near open pit mines or quarries at all, let alone during blasting, at which time radio silence may be required. 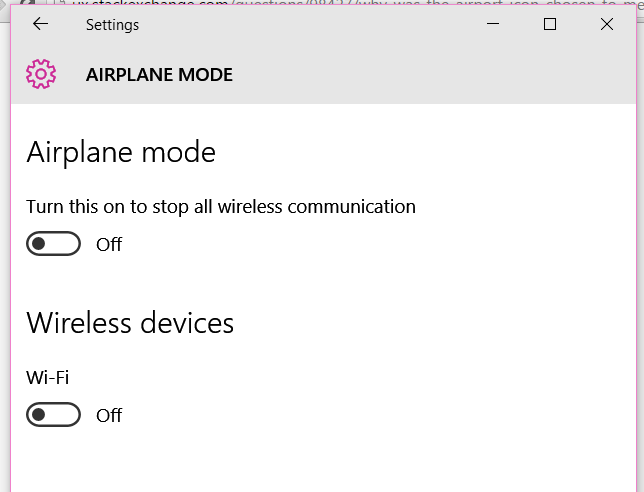 Therefore, even though "blasting mode" might perhaps have been among the nominees for what to call this device state, it lost out to "airplane mode". Why would a key icon not a padlock icon be used to indicate a device keypad is locked? Does the gear icon mean settings, more, or edit? Has Chrome browser chosen the wrong icon for 'Clear'?